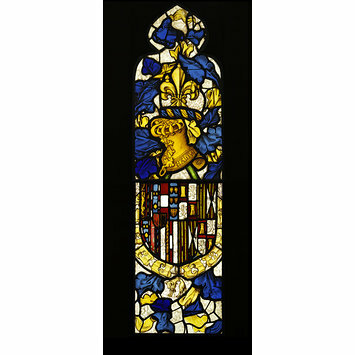 Clear, coloured and flashed glass with painted details and yellow (silver) stain. Panel. Arms of Philip the Handsome and Joanna of Castile, 1496-1506. Grosvenor Thomas collection. The combined arms are those of Burgundy/Hapsburg (Philip) and Aragon, Navarre, Leon and Castile after Spain was unified in 1492. Were 9 windows of two lights each. From the archives of the Confraternity of the Holy Blood – payments for glazing were recorded in 1483 and in 1496. The ancient glass disappeared during the French invasion of 1797. The glass from the Chapel was sold by the municipality of Bruges to a local man for a miniscule sum who then sold them, at great profit, to an English man in the early 19th century. Believe the glass ended up with firm of Watson & Bethell. There are coloured drawings of the windows, pre-dispersal, in the Chapel archives. In 1845 reproductions of the panels were made from these drawings by the glass painter Pluys. In 1913 they were owned by Grosvenor Thomas. He acquired them from Kilburn Grange which was erected after 1830. Rackham, in a letter of 1921, says panels were previously in Kilburn Grange which had been pulled down 10 or 12 years ago [presumably meaning 1909 or 1911]. The family of Major Cecil Peters of Sunbury Manor, Sunbury in Middlesex, formerly owned Kilburn Grange. David Thomas Powell (ac.1800-c.1837), copies (12) of stained glass from the Chapel of the Holy Blood, Bruges. Watercolours. These panels depict the armorials associated with the Dukes of Burgundy and their Hapsburg successors. Two of the armorials commemorate the marriages between Maximilian of Hapsburg and Mary, Duchess of Burgundy and also that of their son Philip the Fair and his wife Joanna, heiress to the Kingdom of Spain. Maximilian probably commissioned these windows to honour his wife's devotion to the Holy Blood and to publicise his dynastic succession to the Dukes of Burgundy.